It feels like spring has come to the bluff country. The snow is nearly gone, and in the last few days we’ve heard Cardinals singing. Yesterday I was cutting brush – the first outside project I’ve done in a while – and a bluebird sang from the top of one of the nearby birch trees. Mike and I have been so busy lately that I haven’t had time to write blog posts, or even take pictures. We’re still working on the Frac Sand Mining issue. We’ve managed to alert folks in the area, so it’s finally becoming a county-wide issue. Mike built a web site, which I’ve been working on too, and we’ve been going to too many meetings and writing lots of testimony. I don’t think the mining will threaten the bluffs themselves – at least not yet. 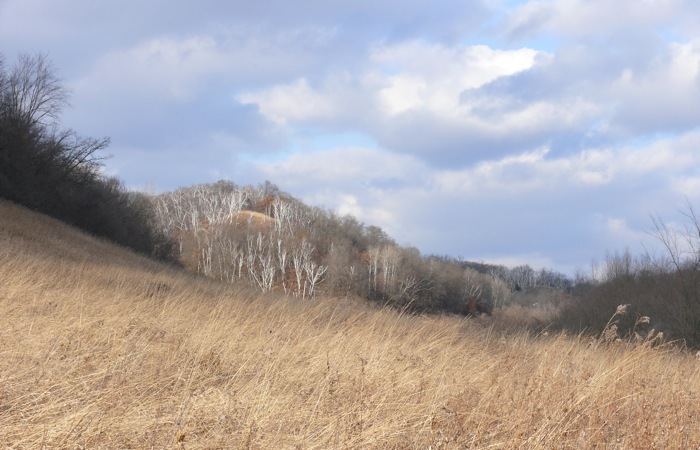 The mining companies seem to be most interested in the flatter, lower hills that are mostly in the northeastern part of the county. Now the big issue is the truck traffic. The mines plan to truck their sand down our beautiful valleys, on the narrow, hilly, winding roads, to the railroad that runs next to the Mississippi. Dramatically increasing truck traffic in these valleys seems like a huge problem for the tourist industry – and for the people who live there. So we’re still working! We still have a little snow, but it’s melting fast on the warm days. Yesterday the temperature got up to about 45F, so we had wet feet by the end of our walk. 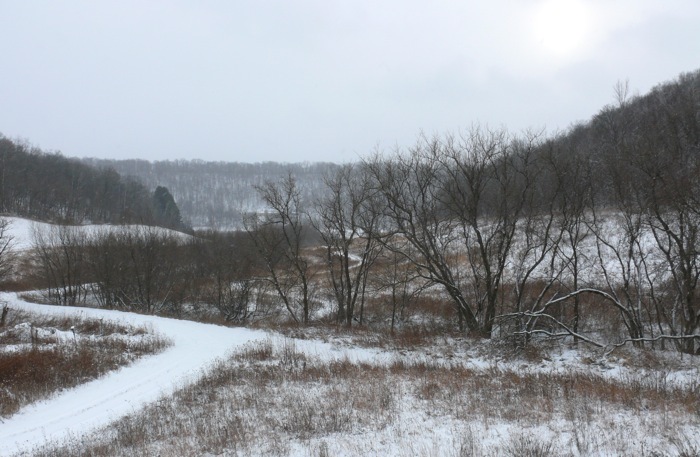 This picture is from mid-January – still pretty wintry, although we haven’t had much snow all winter. A Fox Squirrel has been hanging out under our bird feeders for the last few days. We don’t see many squirrels here – I think there are more predators here than in the city. 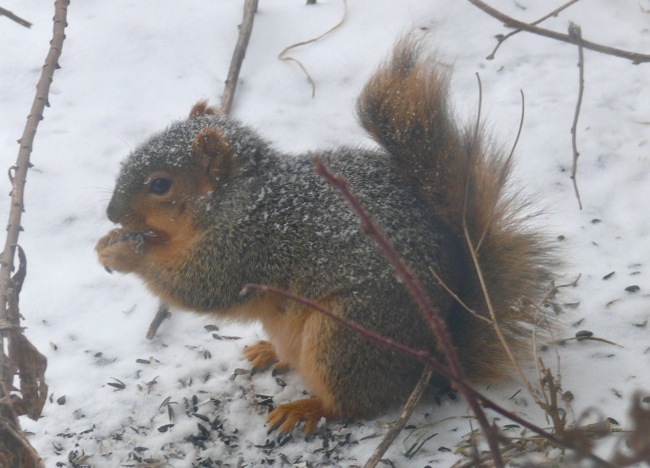 I see – and hear – quite a few Red Squirrels, but very few Gray Squirrels, and only an occasional Fox Squirrel. 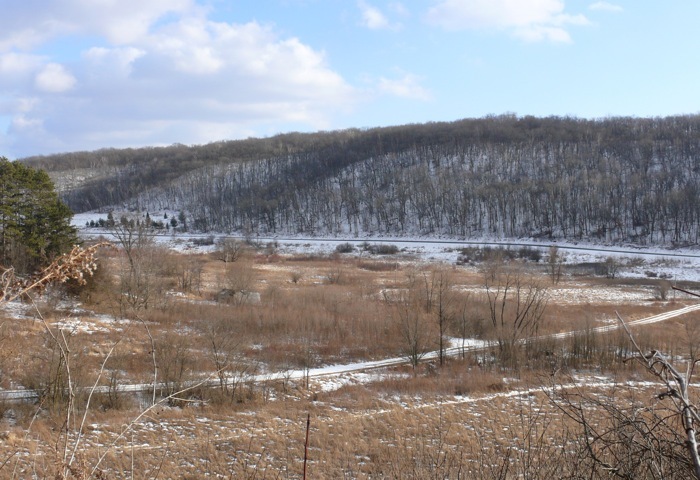 The remnant prairies are almost completely free of snow. 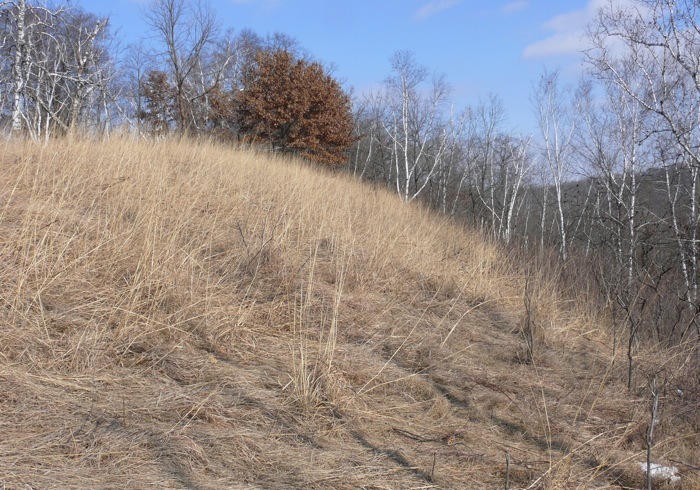 This is Indian Grass Prairie, where I was cutting sumac and raspberries. It’s so much fun to be outside, hearing the sounds and smelling the smells of spring. 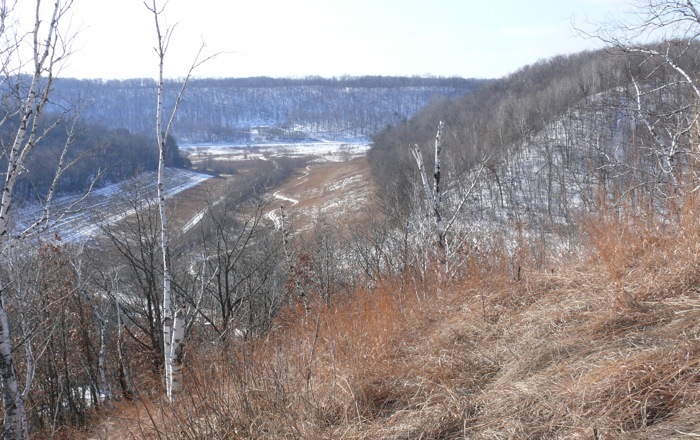 Pat’s Prairie and Indian Grass Point – no snow in sight!